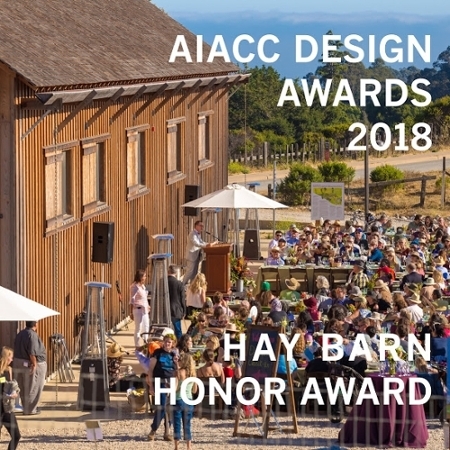 Cowell Ranch Hay Barn receives prestigious American Institute of Architects, California Council Design Award. A crowd of 500 celebrants at the Hay Barn during the 50th Anniversary of the UCSC Farm & Garden banquet dinner. The Cowell Ranch Hay Barn has received an American Institute of Architects, California Council Design Award, one of six major awards the innovative structure has garnered since its public opening in September 2015 as the headquarters of the Center for Agroecology & Sustainable Food Systems (CASFS). The award-winning projects range from historic interpretations to student housing; from institutional and educational to affordable housing. Details are available on the AIACC website. The Hay Barn is a reconstruction of an 1860s Cowell Ranch structure, built to support the thriving lime making operations near the entrance of today’s UC Santa Cruz campus. Incorporating many of the materials and key construction techniques from the original barn, the expansive space has become a popular site for classes, conferences, weddings, and other events, as well as an important site for CASFS activities. The restoration was made possible with a $5 million grant from the Helen and Will Webster Foundation. According to the AIACC website featuring this year’s Design Award winners, “The reconstruction, which was required to meet current codes and aggressive sustainability goals, entailed exhaustive documentation, piece-by-piece deconstruction, painstaking reassembly of the historic structure by weaving together new and old elements, and the incorporation of contemporary program. To learn more about the Hay Barn, see the Cowell Ranch Hay Barn website.